The Future Farmstead House utilizes a TED (The Energy Detective) system to measure energy usage and production. This data is recorded every second, minute, hour, day, and month. 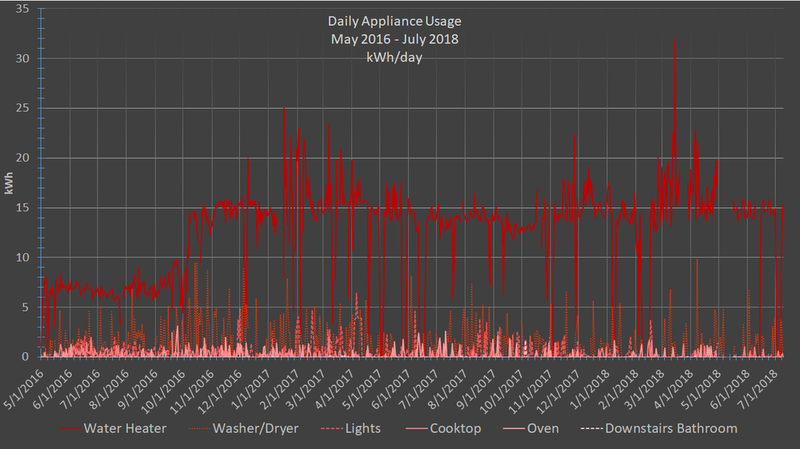 It is then compiled into comprehensible charts that can show trends of appliance usage over seasons of the year. More importantly, they serve as guides for future energy conservation, such as lowering the water heater temperature, or adding more solar panels. The above chart shows the daily energy consumption in blue and production in green. The dark red line shows the current average production of this time period (May 2016 - July 2018). It is apparent that the energy usage is typically greater than the energy production. Therefore, two additional sets of solar panels will be added to the house. 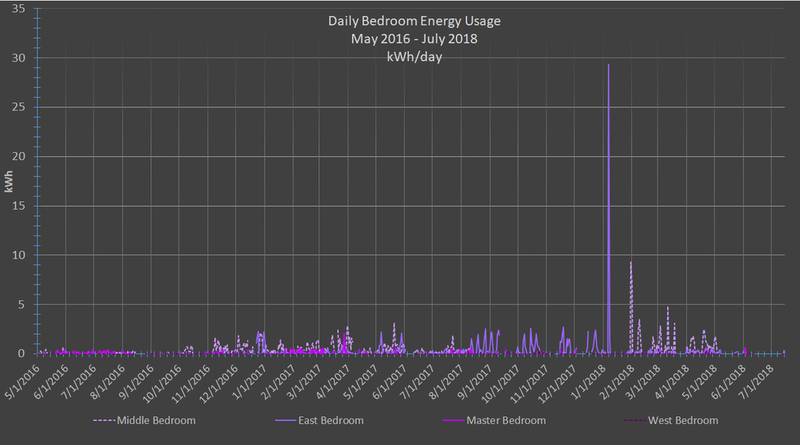 The bright red line shows the predicted average daily production after the addition, which should bring the house close to net zero energy for much of the year. The chart also shows seasonal trends - overall, summer/fall have the most energy consuming days, while winter/spring shows less energy usage. 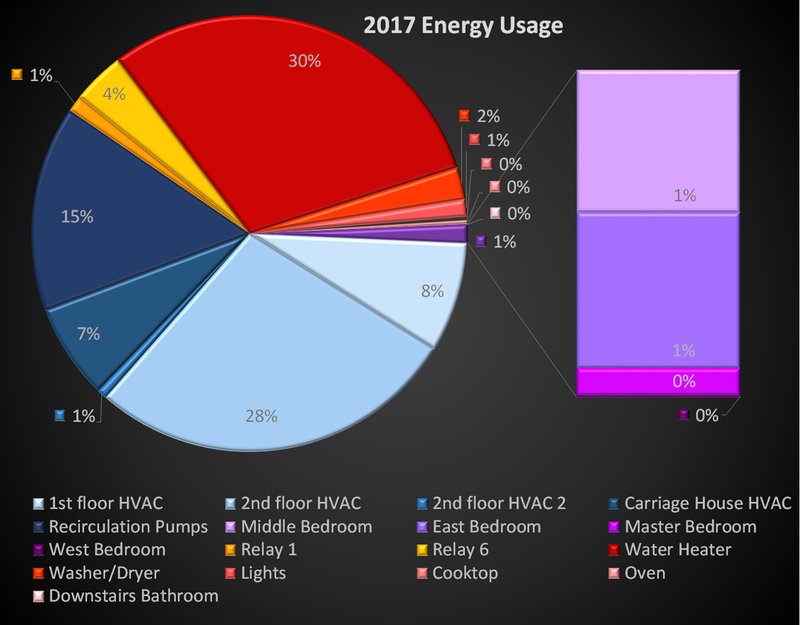 The chart shows the total energy usage per month, as well as by appliance. It also shows August to be the most energy consuming month. This graph shows the impact of each major appliance. 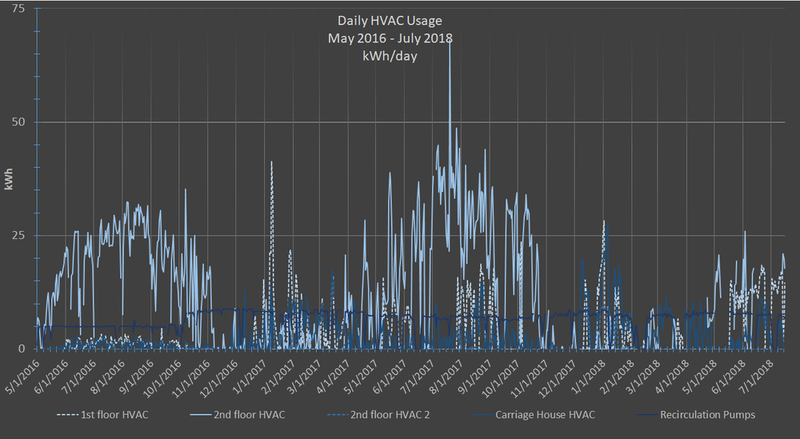 As expected, the combined HVAC comprises most of the house's energy usage, at 59%. The water heater uses 30%, the relays use 5%, the 4 bedrooms use a total of 1%, and the remaining appliances use about 5%.